This past weekend Hairsnipper, Big Ed, RC, and I went down to Outer Banks, NC on a scouting mission for our First State HOG chapter spring trip. On the way we had the opportunity to stop by Diva Customs in Virginia Beach and meet the owner Tami Walker. Tami is an amazing woman! She is writing a book featuring women motorcyclists and their stories about how and why they began to ride. Hairsnipper and I submitted our stories to her a few weeks ago, and we have since shared several emails back and forth. We were going to be coming through the area, so we arranged to take a side trip over to meet this inspirational woman. BTW, at last count Tami still needs 17 ladies’ stories for her book, so if you haven’t sent yours in yet please check out her blog for the details and get it in ASAP. Don’t worry if you think your story isn’t good enough. Chances are whatever it was that inspired you to ride will also be inspiration to someone else. Everyone’s story is a great one! Tami is a female motorcyclist and entrepreneur. She started Diva Customs about four years ago because she found a need for motorcycles and riding gear that fit a woman’s body, not to mention style. Her work is amazing! Check out these pictures of her very first motorcycle. It started life as a Sporty, but now it has a wide-glide front end to make it handle more smoothly, a custom seat, and all kinds of bling (I especially like the air cleaner cover). This bike has a lot of style, just like everything else in Tami’s humble shop. We were welcomed with a smile when we arrived at Diva Customs. Tami was happy to show us around her showroom as well as the service area. In the service area, we saw many examples of her work — lowering bikes, putting on Le Pera Up Front seats, custom gas tanks, smaller diameter grips, and easy-pull hand controls. The Le Pera seats that come in the “up front” models lower the seat height and move the rider 2″ to 3″ closer to the handlebars. Tami said that it is very important to replace the top heavy peanut tank on a Sportster with a custom tank that holds the gasoline at a level below or even with the motorcycles frame. This lowers the center of gravity and eliminates that top heavy feeling that many Sportster owners complain about. The showroom boasted a few completed motorcycle projects for sale, and lots of ladies gear — all of which is fitted and fabulous! There are also some unique feminine touches to her shop, like the full-length mirror decorated with a large-brimmed hat and feather boa and the rack of alluring corsets for sale (for when you are not riding of course). After almost an hour of visiting with Tami and listening to her stories about the shop, her book, and the time she met her idol (Arlen Ness) we needed to get back on the road. We all left with hugs and hopes to see each other again at Delmarva Bike Week in September. These tough economic times are especially difficult for the small business owner. Tami Walker is an intelligent and very knowledgeable woman with her heart in the right place, and I wish her and her company all the best. Check out her website, and keep an eye out for her book when it gets published later in the spring. 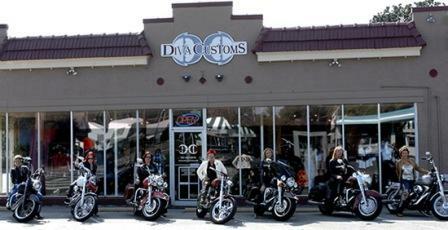 And if you are ever in the Virginia Beach area, make sure to stop by Diva Customs and say “Hi”. You’ll be glad you did. Click here to visit the Diva Customs photo gallery.